There is about to be more beer brewing in the Burg! Troy Bledsoe, local homebrew legend and former Head Brewer at Rapp Brewing, has teamed up with Ryan Sarno and Jessica Holder to bring Overflow Brewing Company to Downtown St. Pete this April. Located less than one block off of Central Avenue, directly behind the Morean Arts Center, Overflow Brewing will make it even easier to brewery hop in Downtown St. Pete. The new digs will be less than half a mile from St. Pete Brewing Company, Cycle Brewing, and Green Bench Brewing Company. 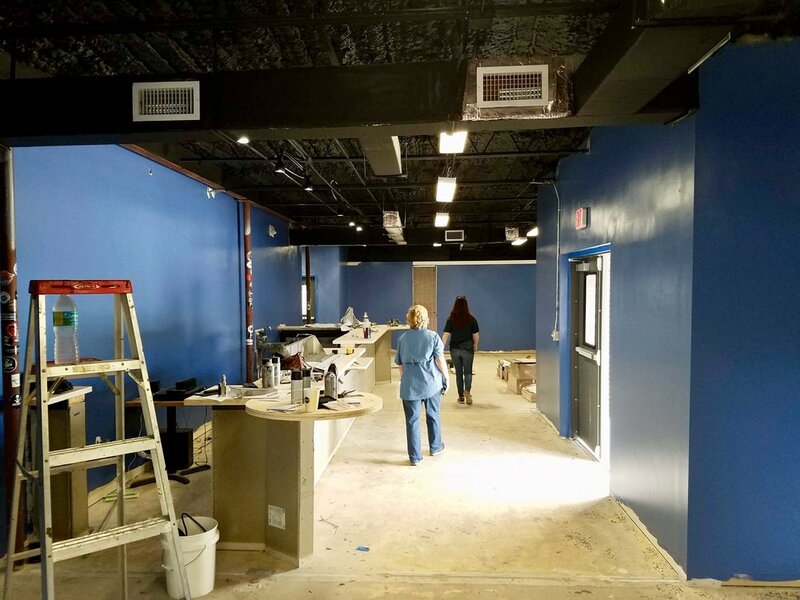 And so the proliferation of breweries in the Sunshine City continues — Overflow will mark the 12th brewery in St. Pete and the 8th located downtown. That’s a lot of beer! But is the St. Pete beer market tapped out? “I don’t think so, especially not for breweries like Overflow that focus on sour beer,” says Ryan Sarno, Head of Business Operations for Overflow Brewing. If you’ve never had a sour beer, you owe it to yourself to give it a try. It’ll change the way you think about beer. Sours have actually been around since the 1800’s, but have only caught on recently in the United States. It’s one of the fastest growing styles of beer in the country and perfect for Florida’s temperate climate. Typically, sours are low in alcohol content (in the range of 3-5% ABV), slightly tart, refreshing, and infused with fruit. It is almost akin to an unsweet lemonade. Origami Aircraft - a Berliner Weisse-style sour ale aged on herbal tea containing hibiscus, elderberries, apple pieces, and strawberries. While Overflow Brewing’s focus will be on brewing the best sour beer in the country, they will also offer non-sour beers. With a total of 16 taps, the plan is to have 5-6 taps of sour beer and the other 9-10 taps with other styles such as stouts, IPAs, and pale ales. One of his most popular beers is called Origami Aircraft, a Berliner Weisse-style sour ale aged on herbal tea containing hibiscus, elderberries, apple pieces, and strawberries. Another fan favorite is a Mojito Berliner brewed with citrus zest. Both will be available at Overflow eventually. Bledsoe was not always a fan of craft beer though. In fact, he was a Coors Light drinker for the longest time. Until one day, about 7 years ago, when he and some friends decided they wanted to try brewing their own beer. Luckily, they had one of the best brewers in the region at their disposal — Greg Rapp, owner of Rapp Brewing Company in Seminole. The tasting room will feature a sports corner on one side and a lounge area on the other. “So we got this group together and we would go over to Greg’s house about once a month, sometimes twice a month to brew,” recounts Bledsoe. After a while, Rapp offered Bledsoe the opportunity to work on the weekends as a bartender at Rapp Brewing. Bledsoe gradually transitioned from the tasting room to the brew house and started brewing on a commercial scale at Rapp Brewing. the brewery includes a 3 barrel system and a walk-in cooler. Still homebrewing on his free time, Bledsoe became enthralled with sour beer. He brought samples of his libations to Paul Unwin, owner of Cajun Cafe on the Bayou in Pinellas Park, and Unwin was so impressed, he offered Bledsoe a table at his annual Sour Beer Festival. After a few years of being Head Brewer at Rapp Brewing and homebrewing for local beer festivals, Bledsoe met Jessica Holder, who convinced him to take his hobby to the next level and open a brewery of his own. They partnered with Ryan Sarno, a childhood friend with business acumen, who helped write up a business plan, find a location, and secure investors. After years of planning and a few initial roadblocks, Overflow Brewing will finally become a reality in a few short weeks. Be sure to visit Overflow Brewing Company once their doors open at the end of April. They will be open 7 days a week, from 3pm to midnight on weekdays, and noon to close on weekends. Follow them on Facebook to stay up-to-date on their progress.